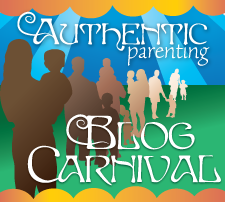 The Authentic Parenting Blog Carnival, co-hosted by Mandy at Living Peacefully with Children and Laura at Authentic Parenting, is hosting a blog hop this month on Traditions and Legacies. As we’re slowly heading up to the holiday season, we’re thinking about what traditions – old or new – we pass on and what we want to leave behind. What do we want our children to remember? What do we want them to carry out into the world? Simply add your post, new or old, to the convenient linky tool below before November 29, 2013. Do you have traditions or legacies in your family? We want to hear! Share your new or previously published blog posts in the easy linky tool below. Entries will be accepted between October 25, 2013 and November 29, 2013. Blog hops are a great way to generate blog traffic and build a supportive community. Your blog will receive links from many other blogs and you and your readers will have the opportunity to discover other blogs with similar goals in mind. Please join us as we embrace Authentic Parenting! We hope you will consider joining us every month as we discuss ways to bring authenticity into our lives and our parenting. Want to help host this blog hop on your own blog? Grab the code and share everyone’s posts with your readers!